Long time readers may remember a post from a ways back detailing the goody bag given out to children who completed a "Kids of Steel" triathlon (25m swim, 1km cycle, 200m run) - my calculations had it at 450 calories with 15 teaspoons of sugar. Well Jennifer Wilson, a reader who'd participated in that original race, decided to do something about it, and this year, instead of M&Ms and candy masquerading as fruit the kids received half a banana and a bubble wand! I wanted to send you a parental "we'd had enough" file "so took matters into our own hands" story. 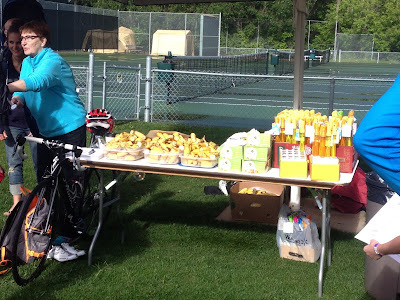 After the 2012 event I had sent a somewhat nasty and true letter to the kids of steel organizers letting them know our feelings on the food provided, the example it set and the impact it could have on kids. After talking to the organizers (who were greatly offended by our comments), they asked "well what are you going to contribute to change it"? Although this question was annoying (IE why is it my job to make sure an active organization promoting kids activity has healthy food choices), I also realized that if I didn't offer to help nothing would get done and I'd be angry again at the race this year. So in August of last year I said I'd like to be on the committee to help with ensuring healthy food choices were there for the kids and help with some of the logistics (i.e. handcuffs) at the race venue/hosting site due to contracts/agreements etc. (Why a city would choose to host a kids event at a facility that charges literally hundreds of dollars for the smallest of healthy platters is beyond me, but that's another story, another battle for another day). They graciously accepted my help and said they would start meeting around November. As November, December passed by and I had not been contacted, I was continually sending emails to try to connect. I knew if I didn't pursue, it wouldn’t happen. Finally in the spring (after many attempts to contact) I received a response and they agreed to meet me to discuss options. Basically I was told they had no money, uphill battle with the location to have outside food, it's only one day (I know you love that one!) etc. etc. However when I asked the question of "If I can get a sponsor for the healthy food" will you work with me? They agreed! The sponsor I was talking about was my husband's company (as we had previously discussed this option as I anticipated their response) and of course they loved to be involved. When I proposed what was needed … I would get all the food (and bubbles for fun! ; again a concept lost on the organizers "why would they get bubbles? "), if they provide the volunteers for day of and man the station. After all my son was racing, and I'm not missing that! Agreed. 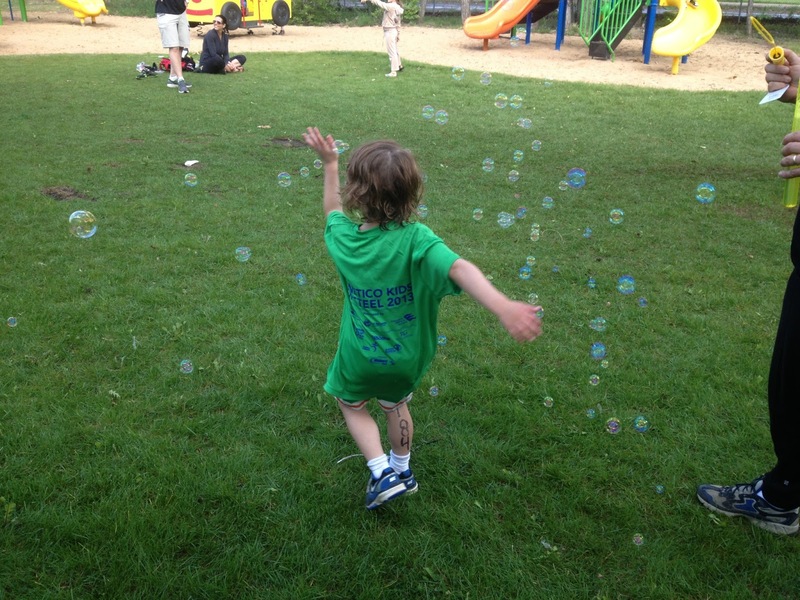 I can't describe the feeling of satisfaction when I saw kids running around at the finish line chasing bubbles (yes, they were moving and running instead of sitting eating junk food, yeah movement! ), eating their bananas, laughing and having fun. What kid doesn't want a bubble stick when they cross the finish line of a race…it was great! Compared to 2012 it was night and day. I'm not saying this works in all cases, nor should we as parents have to FIGHT with the organizers or facilities or camps or whatever to have healthy food. But the satisfaction for us as parents came in knowing that simply having healthy food (and only healthy food) at the finish line of a triathlon can help kids know what to eat and that healthy food is what you should be given post activity, should you be hungry - NOT rewarded with junk food for finishing an event, the feeling was great! Sorry for the ramble - but a good update is always good! Love your blog - thanks for writing it! There is hope … However we do start kindergarten in the fall. We are expecting that to be an adventure…will keep you updated!